Arrowwood is a deciduous shrub (potentially a small tree) with slender trunk(s) and arching branches. 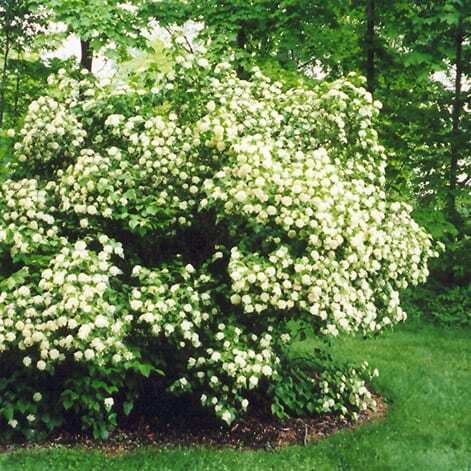 This is a small, rounded Viburnum that usually gets no more 6-10 ft (1.8-3 m) tall with a similar spread. Arrowwood usually has multiple trunks and expands its domain by sending up new shoots from underground runners. The lustrous dark green leaves are opposite, a little sandpapery to the touch, and coarsely toothed along the margins. A prominent lateral vein terminates at the tip of each marginal tooth. The leaves are oval and usually 2-3 in (5-7.7 cm) long. Arrowwood blooms in mid-spring with showy flat topped clusters of little creamy white flowers. The flowers are about an eighth-inch across and the clusters are 3-4 in (7.7-10 cm) across. The bluish black fruits (1-seeded drupes) are ovoid in shape, a little less than a half-inch long, and the clusters can be quite showy. They are bitter to the taste. The leaves ignite with warm shades of yellow and red in autumn.